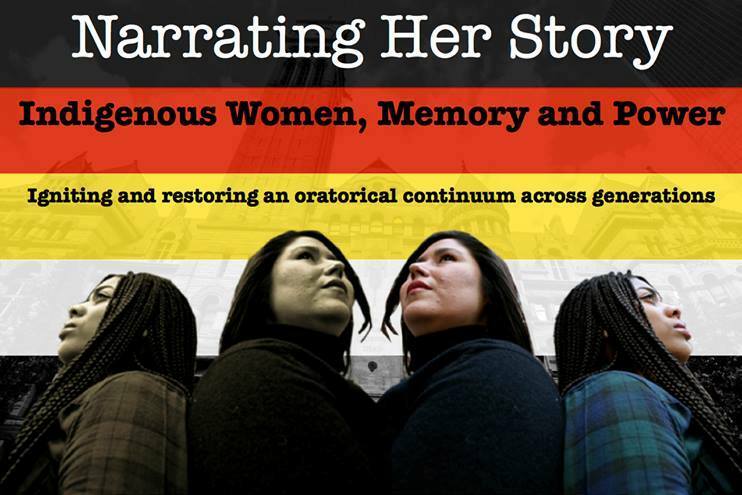 The Indigenous Women, Memory and Power project was a seven-month project that began in September of 2013 at the Native Canadian Centre of Toronto. The project was developed from a collective of Indigenous women and non-Indigenous relatives concerned with lifting up and moving forward the powerful oratorical continuum of Aboriginal women who give and sustain life through teaching, role-modeling, and storytelling across generations. Amber Sandy and Victoria Freeman developed the proposal based on a number of meetings with various members of the collective of Indigenous women and it was then founded by Canadian Heritage, Aboriginal Peoples Program. The project aimed to capture the lived experiences of Indigenous women who made contributions to local and national political movements, education, and community building in Toronto from the 1960’s on to the early 1990’s. The concept of the ‘oratorical continuum’ in the project was coined by Dawnis Kennedy, and contributed to bringing Indigenous women’s voices forward through merging the Oral tradition with today’s contemporary styles of storytelling. Three young women were hired as Documentarians on the project. Krystine Abel, a fourth year student at the University of Toronto, Caitlin Lameman, a first year student at Tyndale University College and Seminary and Cairo Latisha Reddick als a fourth year student at the University of Toronto, facilitated a number of sharing circles with Indigenous women from across Turtle Island alongside Tania Carter, the Coordinator on the project. The women shared their life experiences in the sharing circles and individual interviews. Community members were invited to witness the sharing circles that were centered on individual resistance from the government and other patriarchal and colonial powers, which affected all Indigenous peoples on a collective level. On a localized level these same women contributed to building the Indigenous community and presence in Toronto by developing and affirming their leadership roles in Toronto’s Aboriginal organizations and academic institutions. Most importantly was how all these women were able to maintain their family life, raise their children and support one another through holding close their traditional knowledge and teachings. A selection of audio clips from the sharing circles and interviews will be uploaded to the First Story App this summer. For people interested in accessing the full audio, please make an appointment to go to the First Story office and meet with Karyne Belanger at the Native Canadian Centre of Toronto. Firststory@ncct.on.ca/ 416-964-9087 ext 320.